These figures don’t make sense – have we slipped up somewhere? It’s easy for a journalist to slip up and use somebody else’s idea without crediting him or her. When you’re a politician everyone is always watching in case you slip up. Some children started mindlessly hurling stones at passing vehicles. People waste a lot of time doing mindless things. It’s fairly mindless work – opening mail and keying data into a computer. 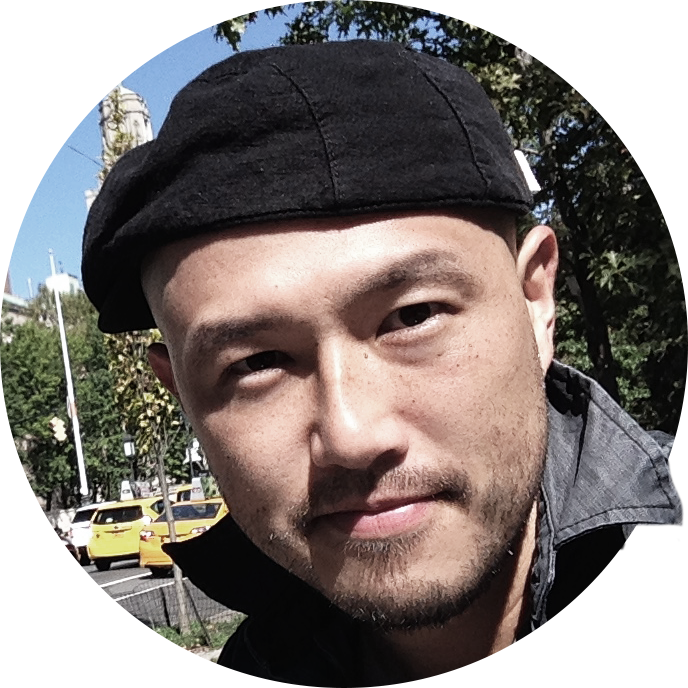 This writer and several of her Russian compatriots now live in New York. That man jabbed me with his umbrella! She kept jabbing at the letter as she spoke. Watch out! You nearly jabbed me in the eye with your umbrella! I jabbed my finger on the needle. The doctor jabbed the needle into the dog’s leg. He jabbed at his food with his fork. A North Korean cheerleader has been caught on video accidentally clapping for American figure skaters. 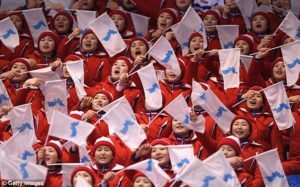 The momentary lapse in discipline among North Korea‘s ‘army of beauties’ occurred during the pair skating short program on February 15 at the Winter Olympics in Pyeongchang. The North Korean cheer squad roared in perfectly synchronized applause and flag waving for the nation’s figure skating duo Ryom Tae Ok and Kim Ju Sok. 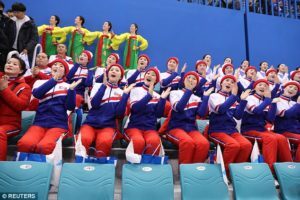 Later in the program, as American skaters Alexa Scimeca Knierim and Chris Knierim took the ice, the North Korean cheerleaders sat stony faced – save for one. There was a momentary pause, then he spoke again. The man admitted driving over the speed limit and apologized for the lapse. Lions were roaring in their cages. Her speech drew enthusiastic applause. Gere walked onto the stage amid thunderous applause. His speech met with (= received) loud applause. So let’s have a round of applause, please, for (= please applaud) a very talented young lady who is going to sing for us. Flanked by a minder and another cheerleader, the young beauty had a distracted half smile on her face as she clapped politely. Without turning, the cheerleader sitting next to her is seen in Japanese news footage jabbing the clapping woman sharply with an elbow. The clapper turns with a bewildered look, as the second cheerleader mutters something to her under her breath. Realizing her mistake, the first cheerleader drops her hands instantly to her lap. Ryom and Kim were the only North Koreans to qualify for the Games, and had been the nation’s best hope for a medal. The pair ended up ranked 13th out of 16 teams. The country’s other athletes were given wildcard entries, part of South Korea’s diplomatic efforts to re-engage with the North. The president entered the room, flanked by his advisers. The president was flanked by senior advisors. Secret Service agents flanked the president’s car. His public-relations minder refused to allow him to answer any of the journalists’ questions. Ruth seemed distracted and not really interested in the meeting. Tania seems very distracted at the moment – I think she’s worried about her brother. Concentrate on the main points of the argument and try not to be distracted by incidental details. Many of the refugees looked bewildered and frightened. Stop muttering and speak up! He was muttering (away) to himself. Laurence muttered something about his wife and left. He muttered something under his breath to the person next to him. He muttered an apology and then left. The best remedy for grief is hard work. Love is a great remedy for unhappiness. “Let’s go,” she muttered under her breath. She doesn’t qualify for maternity leave because she hasn’t been in her job long enough. To qualify for the competition you need to be over 18. He began the diplomatic discussions that resulted in the establishment of NATO. The North Korean cheerleaders, outnumbering the nation’s athletic team by 10 to one, have been a fixture wherever North Korea’s 22 athletes have competed. The young women’s every move has been shadowed by sinister masked guards as they are shuttled from venue to venue. The guards are unarmed, having had to give up their guns under Olympic rules, but they are highly trained in martial arts and are members of elite units in their native North Korea. North Korea’s decision to send the cheering troupe has been seen in some quarters as a propaganda victory, and there is no doubt the cheerleaders have generated fascination across the globe. In our office the women outnumber the men three to one. Despite being outnumbered, they managed to fight back bravely. Girls outnumbered boys by a margin of 2 to 1. He became a fixture (= a regular feature) on television in the 1980s. The police think that the robbers shadowed their victims for days before the crime. The euro has closely shadowed the dollar. Matsuoka was shadowed by a security officer. The ruined house had a sinister appearance. A sinister-looking man sat in the corner of the room. There’s a sinister feeling about this old abandoned house. Elite troops were airlifted to the trouble zone. Concern has been expressed in some quarters about this policy. There is a feeling in certain/some quarters (= some people consider) that a change is needed. There’s no doubt that the show will be successful. There’s little doubt that the measures will be extremely unpopular. I’m having doubts about his ability to do the job. If there’s any doubt about the rocket’s engines, we ought to cancel the launch. The place had held a strange fascination for her ever since. Mass murders hold a gruesome fascination for the public.